2018 will be our 3rd season growing produce at Valley Pasture Farm for multiple families and our 2nd season of having a formal Community Supported Agriculture membership program. Produce share members pay $425 up-front for 16 weeks of fresh, local produce (that’s less than $27 a week!). The memberships allow us to invest in the seeds and equipment needed in the spring to help ensure a successful growing season. A produce share works well for families or veggie loving couples that cook at home often and use vegetables on a regular basis. 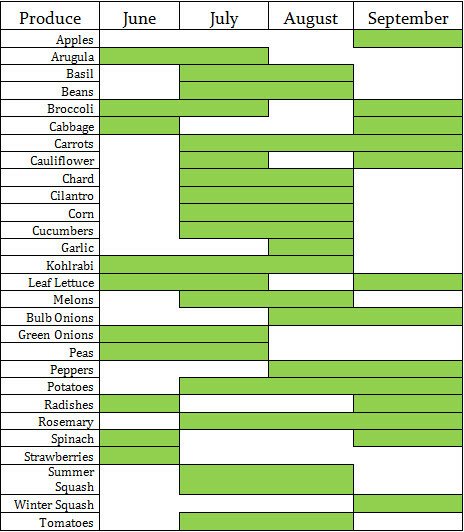 What is included in my CSA Produce Share? Each week, you will receive approx. a bushel of fresh produce & herbs. Occasionally the box will include farm fresh eggs from our free-range laying hens, cut flowers, and other farm goodies. You will receive weekly emails with farm news, current market offerings, recipes, preparation & storage tips, and farm event invitations. You will also receive occasional member-only specials at the Menomonie Farmers Market and will have the first chance to participate in any pre-orders for pastured chicken, eggs, bacon, etc. You will also receive a 10% discount on any items purchased from us at our on-farm stand or at the Menomonie Farmers Market including pastured lamb, pork, & chicken, eggs, canned items, soap, and more – all grown & made on the farm. What will be in my weekly box? Each weeks harvest will include 6-10 (sometimes more!) different items, depending on what is ready for picking. Some items are exclusive for our produce share members – like berries and rhubarb. Check out the produce list to see what we are planning in 2018 and check out the pictures of some of our 2017 weekly boxes. Where do I get my CSA Produce Share? Members can pick up their shares at Valley Pasture Farm in Elk Mound, WI. You can choose to pick up on Tuesdays from 4-7pm, Fridays from 9-10am, or Fridays from 2-5pm. If you are unable to make it to your scheduled pick-up day, just let Katie know ahead of time and we can likely accommodate the change in schedule for that week or double up a future box. Shares that are not picked up can be held for 24 hours, and after that are donated to the local food pantry. This is a great way to see where your food is grown, build a connection to your farm, and see what we are up to. Don’t worry, pick-up can be as quick or as long as you would like it to be – boxes are already prepared and marked for each member and any extra items are labeled and set out for you to grab. New for 2018 – We are offering local home (or workplace) delivery on Tuesdays for $50/season. If you would like your produce delivered to Elk Mound, Colfax, Eau Claire, Menomonie, or Chippewa Falls, please include the delivery address when signing up! Is the produce certified organic? We are not a USDA certified organic farm. We have a goal of becoming Certified Naturally Grown in the next 3 years, which incorporates the USDA organic standards and in some areas, especially animal care, we feel it exceeds those standards. We use non-GMO seeds, natural fertilizer/compost, natural pest-control including companion planting, crop rotations, various mulches, and of course building healthy soil. If you have specific questions about our practices, don’t hesitate to ask. Katie loves chatting about all things farming related and educating our members on why we do, what we do. What do your past members say? “Zucchini and basil jumped in the pan with sun-dried tomatoes, fresh mozzarella and leftover grilled chicken to make dinner in minutes. Rosemary is infusing in olive oil for a batch of salve I’ll make this fall. I am so happy – thanks for growing our food and medicine!” – Lisa Y. “Had the fresh strawberries, pea pods, and cooked up the baby red potatoes to accompany some meatloaf for lunch today. We’re loving the produce from the CSA!” – John M.
“Eek! I was just talking to the boys about how much I’m missing the colors of summer on my plate! I can’t wait to start our weekly trips to the farm again!” – Kait B. This all sounds amazing, how do I become a member? Joining is easy! Review the member agreement, fill out a form, and submit your payment via check or PayPal. We do have a limited number of each type of share available. You are welcome to sign up for multiple shares and/or multiple share types. These are great options if you are a regular Menomonie Farmers Market shopper and would also like to reserve a box of produce each week. Large families, avid canners & preservers, and veggie lovers also benefit from multiple shares.